I like to think as a parent I’m more tolerant of kids screaming in the aisles and having meltdowns. After all, I haven’t been immune to them myself and often think “Oh, I’m sure they understand what I’m going through” when they look at me out of the side of their eyes. Today, however I found myself being a little judge-like. I was in Costco shopping with my 3 1/2 year old. It was morning, so she was still in a good mood and snacking her way through Costco due to the samples. Which put her in a really great mood. My kid is a happy eater, and for those few minutes a silent kid (bonus for me!). Anyhoo…we were checking out. In the lane next to us was a mom and dad and their 3 kids. Guessing around 7, 5 and 3 from the looks of things. The youngest, a boy, was sitting in the cart screaming. Who knows why. I didn’t pay much attention to it. But the screaming kept going and going. And it didn’t seem like either parent was caring much to stop it. Don’t get me wrong, I understand sometimes you can’t stop it and the only recourse you have is to muddle through and get hell out of dodge as quickly as possible. But they didn’t. Get the hell out of dodge that is. Since it was lunchtime, we stayed for lunch. For some reason, a Costco lunch excites my kid like few things and is considered a big treat. Since it costs me all of $3.50 to feed us both, how could I say “no”? So, we placed our order and sat down. The family appeared to be sitting 2 tables in front of us, but then moved to a bigger table next to us. The first thought that popped into my head “ugh, why do they have to sit next to us?” And yes, sonny boy was still carrying on. He continued to carry on and scream through most of our meal, except for the few moments when food was actually in his mouth. I didn’t give the parents any sort of nasty look, but did glance at the kid from time to time trying to figure out what his problem was. Which was odd, because if his parents couldn’t figure it out what made me think I could? That’s when it hit me. I wasn’t as non judgemental as I thought I was. I’m not naive enough to think I don’t judge how others raise their kids and vice versa. But I did think I was above this. The realization did hit home with me, and I guess as an adult that’s a positive sign. We can’t work on ourselves if we don’t realize what we are doing wrong. So, I spent the rest of the meal not glancing over at them and focusing on my own child. I gave her kisses and told her how proud of was of her good behavior. After all, who doesn’t like to hear good things about themselves? I’m sure I also said a quick silent prayer for not letting the screaming kid be mine. Next time, I hope to be quicker with a smile whether it be to the child or the parent and to realize we all have bad days. I’ve recently discovered the bento box craze. 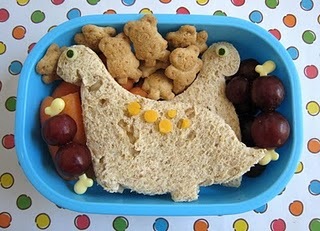 No, we do not have one as my daughter isn’t old enough to eat lunch at school. But if she did, boy oh boy would we be having fun! (On a side note, I did make my own little version for Valentine’s Day yesterday that I’ll share). 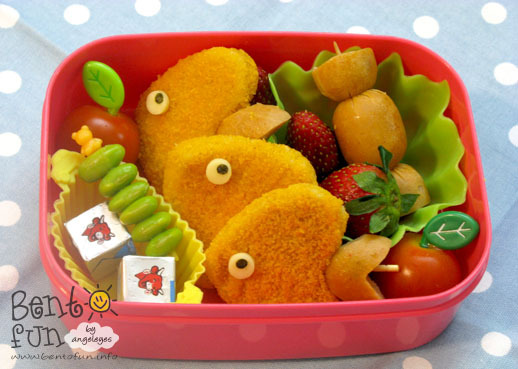 I don’t know if providing fun shaped food in lunches actually makes the kids eat healthier, but it must be exciting for them to open their box every day to see what’s inside. And their friends must be equally as curious too. 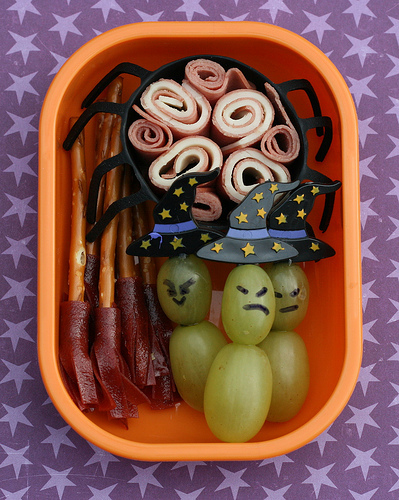 Would this make us the coolest moms in the lunchroom? 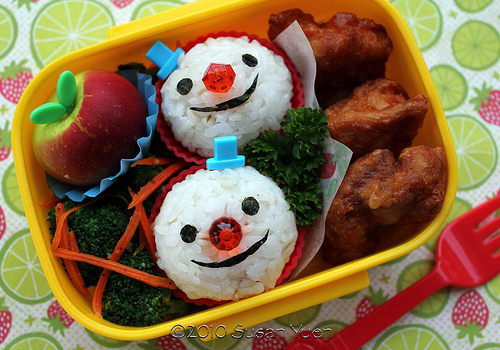 I’ve picked out some fun websites that feature bento lunches to inspire you. Even if you don’t go crazy, they are fun to do now and again to add a little kick to the day. Enjoy! 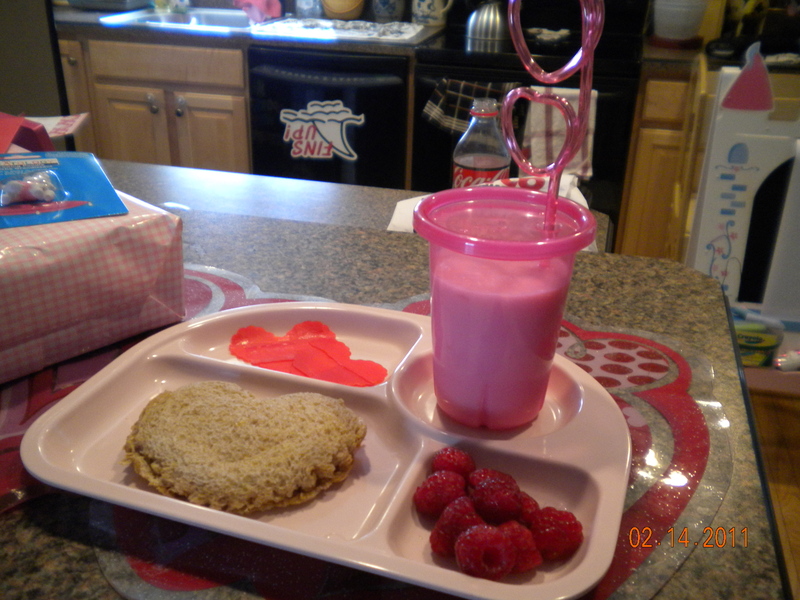 This is the heart/pink inspired lunch I made for my daughter yesterday. 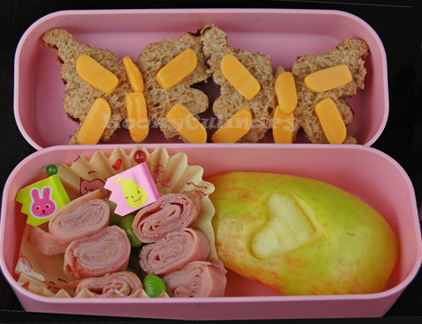 It features a peanut butter and strawberry jelly sandwich cut out with a heart cookie cutter, strawberry fruit leather cut out with a small heart cookie cutter, pink cup with strawberry yogurt drink and a heart straw and raspberries. She was very excited about it! As you’ll be able to see, I’m quite the novice when compared to these ladies! 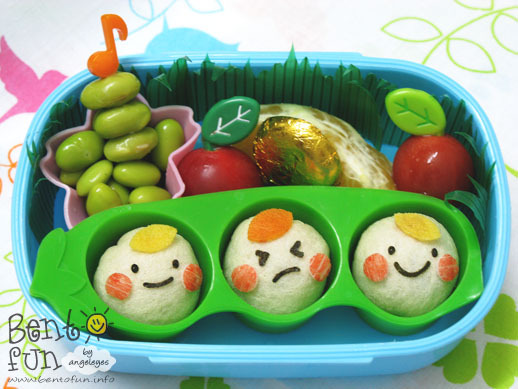 All these sites have great information on how to get started, tutorials, shops, tips, tricks (food marker) and much more should you want to join the bento revo(lution)! Good luck. Later today, the U.S. Department of Agriculture will announce the first new school lunch guidelines in 15 years. In that time, childhood obesity rates in this country have risen yet more. The Academy for Global Citizenship, a school in Chicago, is one of about a thousand schools that have already adopted the food of the future. The underlying requirements are based on an Institute of Medicine study: reduce saturated fat, sugar and sodium. Increase whole grains. Serve both fruits and vegetables daily. And, for the first time, set maximum calorie counts in addition to minimum ones. “This doesn’t mean that we are going to eliminate treats, not at all. But it is a circumstance, situation where treats have a special meaning, a special occasion, a special circumstance that we celebrate with a treat,” Vilsack added. Children consume more than half of their calories at school. The Academy for Global Citizenship is a public charter school that serves school meals that already meet these new USDA standards. 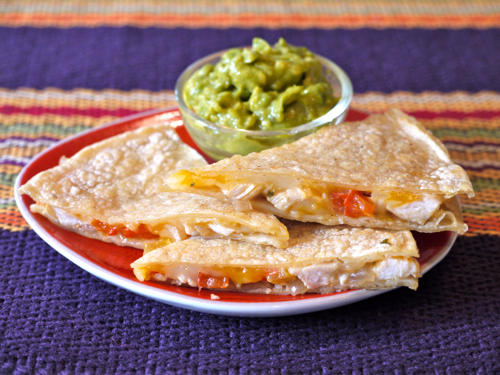 Schools are trying to make healthy food more appealing to students. Seems bans on junk food and soda have been backfiring. And we all know, presentation matters! Schools are trying to make healthy food appear more interesting and exciting. Makes you wonder what’s going on in your schools, doesn’t it? Hide the chocolate milk behind the plain milk. Get those apples and oranges out of stainless steel bins and into pretty baskets. Cash-only for desserts. These subtle moves can entice kids to make healthier choices in school lunch lines, studies show. Food and restaurant marketers have long used similar tricks. Now the government wants in on the act. The U.S. Department of Agriculture announced what it called a major new initiative Tuesday, giving $2 million to food behavior scientists to find ways to use psychology to improve kids’ use of the federal schoollunch program and fight childhood obesity. A fresh approach is clearly needed, those behind the effort say. About one-third of children and teens are obese or overweight. Bans on soda and junk food have backfired in some places. Some students have abandoned school meal programs that tried to force-feed healthy choices. When one school district put fruit on every lunch tray, most of it ended up in the garbage. So instead of pursuing a carrot or a stick approach, schools want to entice kids to choose the carrot sticks, figuring children are more likely to eat something they select themselves. What reasons have you had to celebrate recently? A new job? Birthday? Anniversary? Just a great day? 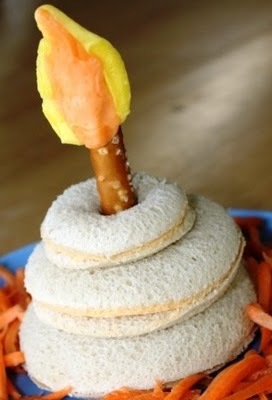 Or maybe a special back to school celebration sandwich. Microwave one yellow and 1/2 orange starburst candies for about 7 seconds to soften. Place orange candy on top of yellow, smash together and form a “candle flame” shape. Push onto the top of a pretzel rod. 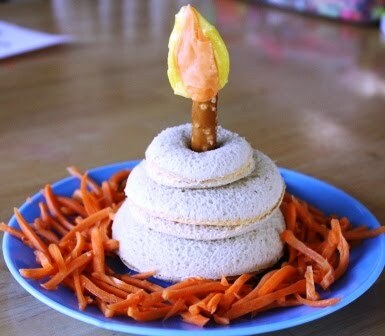 Stack sandwiches with the largest one on the bottom and press pretzel rod “candle” through the sandwiches (you can cut the pretzel if it’s too long). 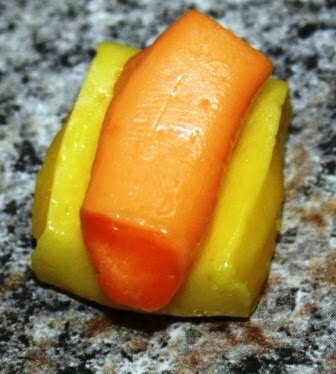 Serve with shredded carrots or any other fresh fruits & veggies. CELEBRATE!! 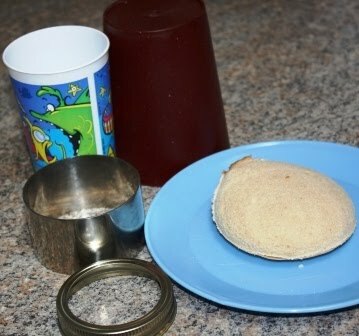 :) We don’t like to be wasteful, so I served the extra sandwich “scraps” on a little plate on the side. I always make a large vat of these since they’re lovely to keep to pick at in the fridge, too. Plus, although they’re easy to make, you do need quite a few ingredients — and this holds true whether you’re making a small or big batch, so you may as well go all out. Whisk together all of the dressing ingredients in a bowl or small pitcher. Put the noodles, bean sprouts, snow peas, sliced red pepper, and sliced scallions into a bowl. Pour over the dressing and mix thoroughly to coat everything well. Sprinkle with the sesame seeds and cilantro and pack up as needed.